[EAN: 9780282069315], New book, [PU: Forgotten Books], Language: English . Brand New Book ***** Print on Demand *****. 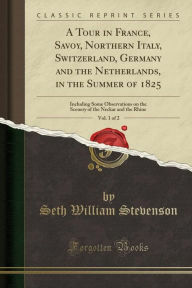 Excerpt from A Tour in France, Savoy, Northern Italy, Switzerland, Germany and the Netherlands, in the Summer of 1825, Vol. 1 of 2: Including Some Observations on the Scenery of the Neckar and the Rhine IN this Travelling age, and. Amidst. The prevail ing mania for writing, Tours, to. Prqdncs any thing novel in that way is a difficulty, which the Author is very far from pretending to have overcome. But, encouraged by the friendly approbation bestowed on a former volume, e he ventures to lay the present work before the Public. And should it be thought that he has dwelt too long on some subjects, or expressed himself too warmly on others; the best apology he can offer is that the descriptions, remarks. About the Publisher Forgotten Books publishes hundreds of thousands of rare and classic books. Find more at This book is a reproduction of an important historical work. Forgotten Books uses state-of-the-art technology to digitally reconstruct the work, preserving the original format whilst repairing imperfections present in the aged copy. In rare cases, an imperfection in the original, such as a blemish or missing page, may be replicated in our edition. We do, however, repair the vast majority of imperfections successfully; any imperfections that remain are intentionally left to preserve the state of such historical works. [EAN: 9780282069315], Neubuch, [PU: Forgotten Books], This item is printed on demand for shipment within 3 working days. IN this Travelling age, and. Amidst. The prevail ing mania for writing, Tours, to. Prqdncs any thing novel in that way is a difficulty, which the Author is very far from pretending to have overcome. But, encouraged by the friendly approbation bestowed on a former volume,e he ventures to lay the present work before the Public. And should it be thought that he has dwelt too long on some subjects, or expressed himself too warmly on others; the best apology he can offer is that the descriptions, remarks.